In the hands of capable and well-informed students, the Redlands Student Investment Fund (RSIF) has turned $100,000 into more than $158,000 over the last 10 years. The student investment fund began in 2006, and students worked with a mock portfolio. But in 2009, the fund received seed money from several members of the Board of Trustees, their spouses, and others who continue to support the organization, and students began to have the opportunity to gain real experience in investing and managing a portfolio. The organization meets weekly on Tuesdays at 7 p.m. in Duke 109. Meetings typically begin with news segments in which the members discuss current news and how it can affect the market, their portfolio, or investment opportunities. The next part of the meeting is usually an education segment, which teaches members the basics of investing terms and concepts. Emily Myer ’19, the current president of RSIF who has been involved in the organization since her first year at the University, says, "I came in as a German and psychology double major, and, because of the student investment fund, I changed my majors to financial economics and accounting.” Myer states that being a member helped her through her classes and gave her more exposure to the real world. She took on the role as president because she saw the fund’s growth and wanted to help that growth continue. Another benefit of the fund's growth is that it has enabled a designated student scholarship for an RSIF member. Myer is this year's recipient. RSIF has recently partnered with KIVA, a nonprofit microlending organization. Students work with the fund to lend small amounts of money to developing countries and individuals in impoverished areas. In this peer-to-peer economy outside the banking system, the loans help people start businesses. The Redlands Student Investment Fund receives interest along with repayment; the current repayment rate is 96.8 percent. The organization has recently received approval from Director of Community Service Learning Tony Mueller to offer RSIF for Community Service Activity Course credits through the partnership with KIVA. The course counts as two credits, and students who register for the course twice fulfill their CSAC requirements. If taking the course for credit, students are required to have good attendance and present two pitches. 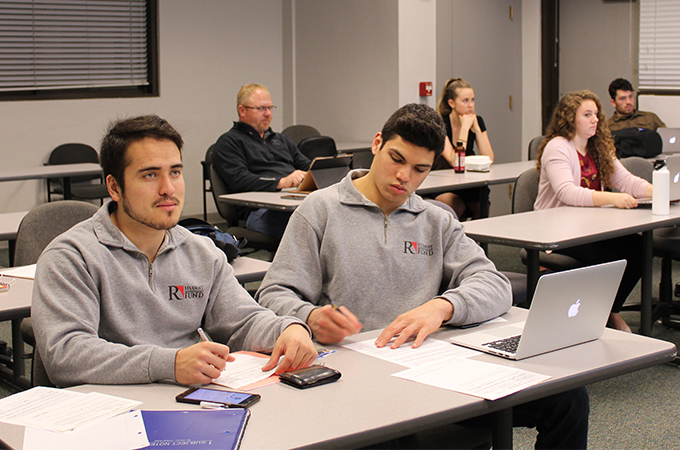 "RSIF provides a unique learning opportunity in which students gain first-hand experience trading on the stock market," says Torin Bakos ’19, an analyst for two years and chief investment officer for one. He adds the fund is useful because it’s not a course in which students are given a problem to solve with a formula from a textbook; rather, the environment teaches students to think critically and to engage in a specific type of creative thinking. In the past few years, RSIF has seen growth in both membership and portfolio size. Many students join because they are business, economics, or accounting majors, or they plan to start their own business. Other students join because they want to be more comfortable with the subject and learn something new. The fund welcomes all students and understands that most may not have a background or knowledge in the field. Members of the fund encourage everyone to join, saying that most students who join as first-years choose to stay until they graduate or recognize RSIF as one of the most important parts of their college experience. Learn more about clubs and organizations on campus.